Join Imani Muhammad and her community organization, Youth Organized and United to Help ( Y.O.U.th ) on April 6th as they present their digital campaign of #BooksNotBarsOR. Part of the event will show community educators why the organization, which formerly focused on non-violence using hip hop elements, changed their mission to motivate, inspire and empower youth, family and educators to dismantle the school to prison pipeline. Y.O.U.th’s new goal is to raise awareness by January 2020 of the school-to-prison pipeline epidemic and to intentionally shift the path our youth and educators through trainings. The digital marketing campaign is in partnership with a national collective called Goodie. The #BooksNotBarsOR initiative promises to raise awareness to 1 million people around the school to prison pipeline epidemic in Oregon and to motivate educators to get training in equity and trauma-informed care– especially when working with Black youth in Oregon’s public educational system– through educators striving to change the experience in the classroom. Books Not Bars provides resources for educators to change the experience in the school system. Imani Muhammad and Y.O.U.th (Youth Organized United to help) are creating and offering culturally specific trainings for Portland Public Schools and educators to help reverse the schools-to-prison pipeline using data, trauma-informed care strategies and support from educators of color. Here is the press release for the new #BooksNotBarsOR Initiative. 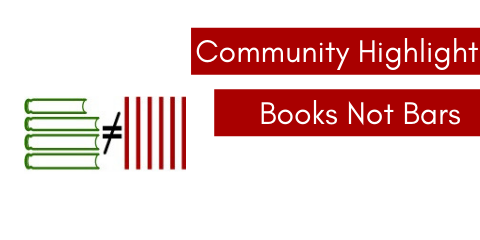 Follow the BooksNotBarsOR campaign! Go follow them on IG @booksnotbarsor and FB www.facebook.com/booksnotbars. Join the movement, search our resources, make a donation. Engage.